Bere (pronounced bear) is possibly the oldest grain still in commercial production. It is thought to have been brought to Britain by the Vikings in the 8th century, or possibly even earlier. That’s over 1,300 years old! 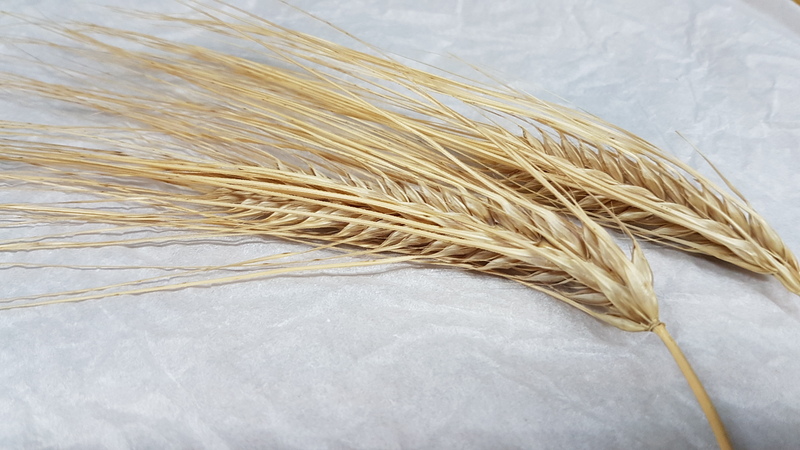 In the late 1800s through to the early 1900s it was one of the most important crops in northern Scotland because it grew quickly in the short summers, gaining the nickname of ‘90 Day’, and was incredibly versatile, providing flour and malt as well straw for thatch and animal bedding. And if they were malting it, they were almost definitely brewing with it. Today Bere is almost exclusively grown in Orkney and a few islands even further north, with the majority of it being milled for flour. 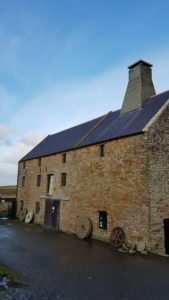 However, the 300-year-old Barony Mills also malt a small amount for brewing. We were incredibly lucky to get hold of some of this rare malt thanks to local Experimental Beer Archaeologists Merryn and Graham Dineley putting us in touch with the miller (who rather randomly turned out to be an old friend of Mrs Beer Nouveau’s parents who live nearby!). 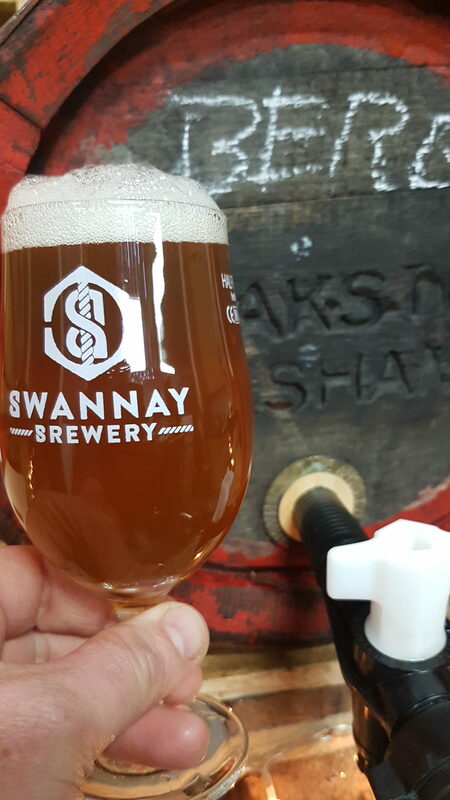 Although the only places brewing exclusively with Bere malt now are whisky distilleries, Swannay Brewery just down the road from Barony Mills do make a very fine beer using it. But what was Viking Ale like? We don’t know. How strong was it? We don’t know. How did they make it? We don’t know. What did it taste like? We don’t know. Nobody alive today was around when the Vikings were expanding their civilisation across the seas. You may look at some folks at CAMRA events and think they were, but they weren’t. Honest. So we don’t actually know for certain what Viking Ale was like. But we can build some informed theories. Firstly, how strong was it? This was never written down, but we can extrapolate using our knowledge of the vessels they had. To make beer you first have to mash. This involves simply mixing hot water with the malted grain so that saccharification can take place, converting starches into sugars. If we know the size of the vessel used, we know the maximum amount of malt it can hold. We then also know the amount of water needed to get the sugars out of the grain. From this, we can work out the maximum strength that Viking Ale could possibly have been. Except that all grains have different amounts of sugars available, and the different ways of malting and kilning each grain affect that further. This is where Bere malt comes in. This is the Viking grain. Albeit grown with modern techniques in a changed climate. But it’s a lot closer to what we’re after than using a modern pale malt. Merryn and Graham (again huge thanks to these folk!) have brewed with Bere a few times and have found that you get about 60% of the efficiency you get from a modern pale malt. This means that Bere malt gives roughly 48% efficiency, which is truly awful, less than Chocolate Malt which is really only good for colour and flavour. Plugging these figures into our brewing spreadsheets we can tell that with a dry mash (not much water), Viking Ale would have been about 13% abv, and with a wet mash (what we use these days) it would have been about 2.6%. So how strong was it then? Who knows! Anything between 2.6% and 13% abv depending on how much water they added. But let’s be practical about this. It takes a day to brew beer. Whether you brew 10 litres of 13% ale or 40 litres of 3.5% ale, it takes the same time with the same ingredients. Why spend a day brewing just 10 litres when you can spend the same amount of time and have 40 litres? Well, because 13% is stronger, and arguably better, than 3.5%. If they liked stronger ale, it’s likely they’ll have made it stronger. If they liked weaker ale, it’s more likely they’ll have made it weaker. But a full day’s brewing for an evening’s family drinking really doesn’t seem practical. The problem is, without brewery ledgers, it’s kinda hard to know for certain. Secondly, how did they make it? There are ideas. We’ve been reading a lot of Merryn’s work recently, as well as the writings of many of the people she references. And there are ideas about earthenware pots of various sizes as well as using troughs buried in the ground (great insulation! ), and there’s some really cool experimental archaeology where they actually brew beer in these things. But nobody’s discovered a catalogue of Early Medieval Brewing Equipment, yet, so cleverer minds than mine have to look at what they find and try and piece together (sometimes literally) what they were used for. Except when they cite ‘ritual’, that’s basically the professional way of admitting they don’t know. But what has been found through experiment is that beer can be made by mashing and fermenting in the kind of vessels that have been dug up. And the process is really not that dissimilar to how we make beer today. This we do know. Bere malt, water, yeast and meadowsweet. Not hops. Hops can grow pretty much anywhere, but there’s no evidence of them growing in Orkney or further north. Whereas meadowsweet was abundant. So meadowsweet it was. Again, thanks to the work of Merryn and Brew Classical, we know what meadowsweet in ale was like as they’ve both previously brewed with it. However, each year the harvests would have been different too, affecting the grain and the herbs and the flavour. The water would have changed, the mash timing wouldn’t have been accurate, there were no hydrometers let alone refractometers, scales and balances were of the “meh” variety and temperature control was down to the gods. Literally. So things would have changed between each brew, sometimes a little, sometimes a lot. And then there were the extra ingredients. Well, we’ve brewed it to find out. We took some of this Bere malt and brewed with it. We used a two-step mash to raise the temperature towards the end (to mimic hot rock brewing) and managed to get a much higher efficiency from it, almost double in fact! The malt itself is quite smoky and the wort was initially heavily peaty/smoky. Meadowsweet is not in the slightest bit like hops, there’s no bitter taste or citrus aromas, it’s incredibly medicinal. We were warned about this, but even so it was far more powerful than we’d expected. Almost like drinking TCP, something usually associated with an infection. For yeast we used Kveik, a traditional Norwegian farmhouse yeast that is likely the closest yeast there is to what the Vikings would have used. The fermented beer was, initially, different. But it wasn’t finished at this point: we then put it into a wooden cask to condition. We tapped this for a sneak peek last weekend and it’s unlike anything you will have drunk before. The initial aroma is both smoky and peaty as the Bere malt really comes forward, with only a hint of the meadowsweet on the nose. The body itself is very light, very, very light. It’s incredibly easy to just swill back with virtually no hint of the 5% abv it contains. 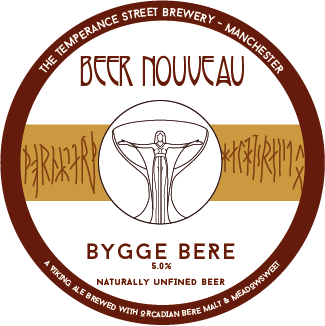 There’s a slight tartness to the taste, mostly from the Kveik yeast with the meadowsweet once again just being a hint. Overall this is definitely a beer for quaffing, and we can see where the image of Vikings chucking back horns of ale comes from. We’ve only got the one wooden cask of this beer, and don’t expect it to hang around long. We will be brewing it again at some point in the future, if we can get more of the very special malt needed, ideally to condition in a barrel for bottling. But for now, if you want to try this historic beer you’ll need to pop down to our brewery tap before it runs out!